On August 20, 2015 Nordstrom has launched SPACE which is a new shop curated by Olivia Kim, Nordstrom Director of Creative Projects, featuring emerging and advanced designers. SPACE lives in its own boutique-like environment inside the Nordstrom Collectors department alongside other designer collections at the retailer's four flagship stores and online. 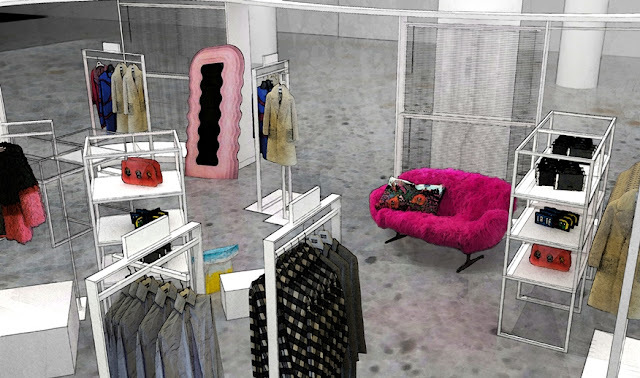 The shop features a cross-category offering of seasonal collections of apparel, shoes, handbags and accessories collections from designers including Simone Rocha, Marques'Almeida, Jacquemus, Isa Arfen, Anthony Vaccarello, Shrimps, Tricot Comme des Garçons, Noir Kei Ninomiya, Creatures of the Wind, Vetements, Faustine Steinmetz, Mociun, Sophie Bille Brahe, and more. Kim worked with the Nordstrom design team to create a framework that feels open and airy, then decorated each SPACE with work from artists, furniture makers and artisans so each feels uniquely warm and inviting. The shop features pieces like Ettore Sottsass's Ultrafragola wavy neon mirrors and woven rubber benches and chairs by Max Lamb. SPACE also includes a colorful vintage bench by Verner Panton, petrified stone risers by Matt White, Korean enamel-topped tables from Kwangho Lee, and other one-of-a-kind pieces from Kim's favorite artists sourced from Johnson Trading Gallery in New York City. For SPACE's inaugural ad campaign, Kim curated looks from Vetements, Simone Rocha, Undercover, Isa Arfen, Rosetta Getty, Y's by Yohji Yamamoto, Julien David and And Re Walker and tapped notable stylist Mel Ottenberg and photographer Collier Schorr to bring the campaign to life. The retail store image below will give you an idea regarding the store layout. This is a rendering for an example.